A chicken marsala that's tantalizingly good. Sprinkle chicken with salt and pepper. Heat oil in a large non-stick skillet over medium-high heat. Add chicken and cook through, about 3 minutes on each side. Transfer chicken to a platter and keep warm. Add mushrooms to skillet and cook, stirring frequently, until browned, about 3 minutes. Sprinkle mushrooms with flour, stirring to blend. Add the marsala and broth; bring to a boil. Cook, stirring occasionally, until sauce thickens, about 3 minutes. 634 members have added this recipe to their cookbook. Cooked in 2 slices of bacon before cooking up the mushrooms. And added about 1/4c. Half and half to make a cream sauce. Garnished with green onions. YUMMY!!! Will be taking some to work for the next 2 nights. 100x thank you! We made this the other night and it was absolutely what I wanted. The flour is little iffy, but it definitely work substituting heavy cream. It was wonderful! I used chicken tenderloins & I added a bit of chopped sun dried tomatoes. I would try it with more mushrooms and possibly some more spices like cayenne pepper. How much is 1 serving? Carb wise, yes you could have on induction phase, however, flour is not allowed. I would saute the mushrooms in butter flavored non stick spray,the marsala wine then add about 2 to 3 tablespoons of heavy cream. Simmer until thickened and then spoon sauce over chicken. An easy soup to warm your tummy. 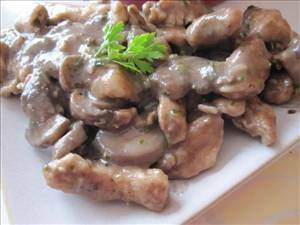 There are 168 calories in 1 serving of Mushroom Chicken Marsala. Calorie break-down: 21% fat, 9% carbs, 69% protein.